Chris Snyder has been a board member of the Canadian Landmine Foundation (CLMF) since 2004. 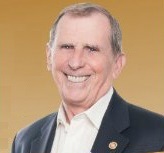 He served as Chair from 2013-17. Always active in not-for-profit work, Chris, in addition to the work he does on behalf of CLMF, is the founding Chair of HIP (Honouring Indigenous People). HIP focuses on the education of Indigenous peoples and creation of awareness of Indigenous culture, history and issues for all Canadians. A member of The Rotary Club of Toronto, Cris is also co-ordinator of sweat equity projects. He has organized over 30 groups of Rotarians & Friends who have gone to the Dominican Republic, Burkina Faso, Tanzania, Malawi and Cambodia to work with local people primarily in the building of schools. Chris has been active as a personal financial advisor for 48 years. He is the Chair and co-founder of the ECC Group and the author of several best-selling books on personal finance, most recently “Be Smart With Your Money”. Chris is also a recipient of both the Queen’s Gold and Diamond Jubilee medals for his not-for-profit work. He is married to his wife Pat and together they have 3 children: Jennifer, Heather and Stuart, and 4 grandchildren. "Life is about making choices: you can either spend three quid on a glossy magazine or you can spend it clearing three square metres of minefield and help give people their lives back. As simple as that."